In the spring and summer of 2011 Worcestershire County Council and NHS Worcestershire funded research to establish how the Voluntary and Community Sector (VCS) could improve its voice and participate more effectively in strategic partnerships in the future. In September 2011 the “Changing Landscapes” conference at Worcester Rugby Club was well attended by both VCS and public sector partners and agreed a new model for VCS Strategic Engagement. The Worcestershire Partnership provided funding for Worcestershire Voices for three years from April 2012. It recognised the role of Worcestershire Voices within the partnership. The Board members were drawn from across the sector but were not ‘representatives’ of their organisations but brought their skills, knowledge and experience to the further the aims. Worcestershire Voices was supported by an Administrator and a Co-ordinator. During 2015 it became clear that the original model needed to change to be effective in the changed circumstances. 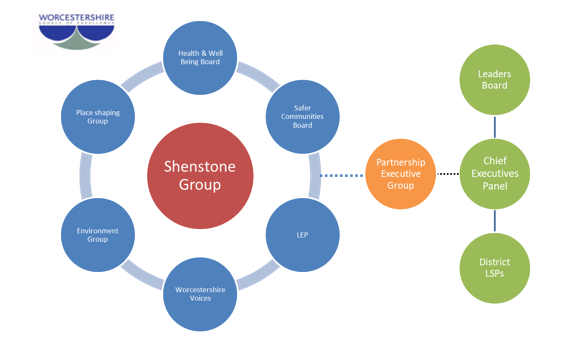 Views of Board members and feedback from stakeholders including an external 360 degree review of the chair informed discussions at two workshops to develop the new streamlined model for Worcestershire Voices, which took effect from autumn 2015. Worcestershire County Council, the three Worcestershire NHS Clinical Commissioning Groups, West Mercia Police and Hereford and Worcester Fire and Rescue Service agreed to fund Worcestershire Voices for a further three years until March 2018.